I once passed a fruitful couple of hours with a friend counting down our top ten food experiences from 10 to 1, describing them in vivid detail as we went. My Number One involved freshly caught river fish, and a cold winter's day with less than $5 in my pocket. The fish had been hauled up from the ice-green waters of the Bosphorus in Istanbul, onto the back of a rickety wooden boat tied to a bridge, filleted, fried in olive oil atop a 44 gallon drum converted to a griddle, and slapped between a half loaf of crusty bread. It was the best meal ever, for the taste, the view, and value for money; and a worthy Number One. Well, it's now nineteen years since that Turkish fish meal, and I'm sorry Number One, you're now officially Number Two, and Ten just fell off the end of the list to make way for the Best Fish Ever. 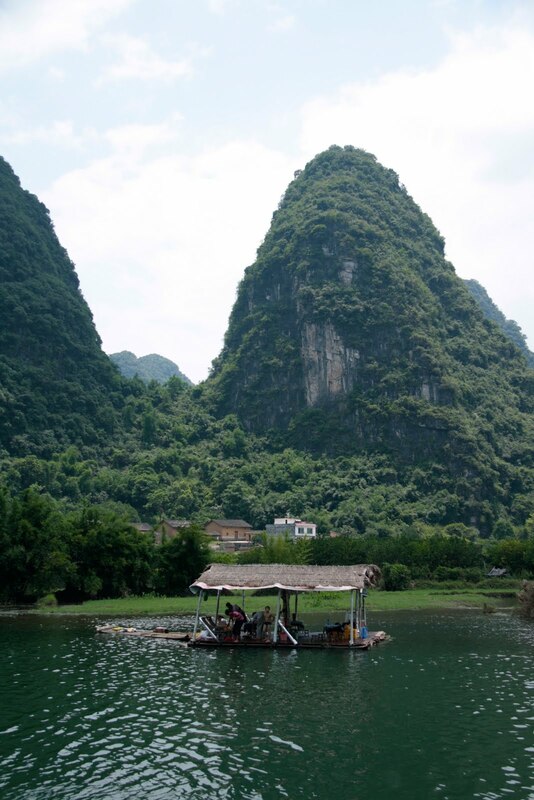 There are remarkable similarities - freshly caught river fish, this time fried in a makeshift kitchen by the riverside, and paddled across to a floating mid-river restaurant by bamboo raft. It's a hot summer's day, rather than midwinter, and prices have gone up since 1991, so I now have the equivalent of $10 tied tightly in a plastic bag perched under my hat as I swim across to the restaurant from where my bicycle is parked by the river's edge. Most customers arrive by raft, rather than by swimming, and so there is a lot of interest in the strange foreign woman who wants to freestyle her way to lunch. The fish is the only dish offered. Recently alive, it has been fried until the skin crisps, then once cold, skewered and painted with a marinade made (I think) from ground peanuts, sesame seeds, chilli, coriander seed, cumin and oil. 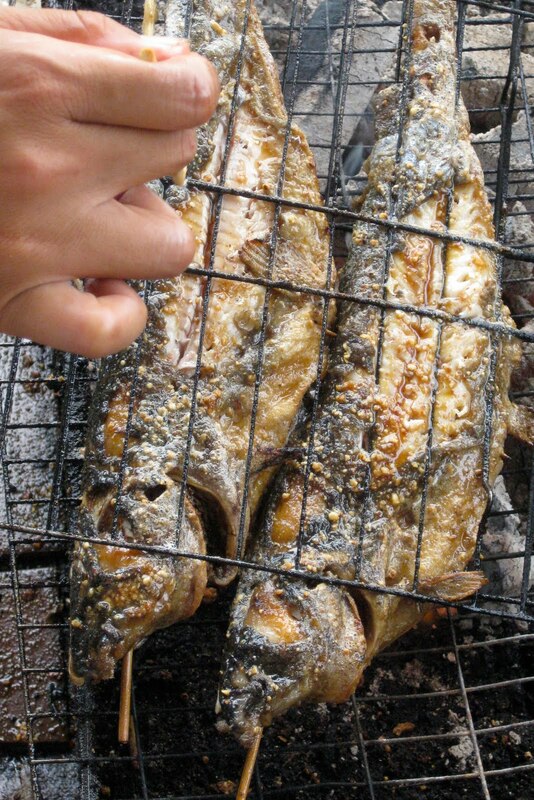 The fish is now cooked a second time on the floating raft restaurant by being barbecued over a charcoal brazier. The marinade melts into the skin with the heat of the coals and some kind of magical alchemy takes place between the oils of the fish, the nutty marinade and the smoke from the charcoal. The flavour is at once robust and complex, harmonising with the firm flesh of the fish. I ply the waitress for the recipe, but my Chinese is too poor, and in my heart I know I can't reproduce this at home, that this will only be a Number One meal when the other elements are all there too - the magnificent Yulong River all around, bamboo rafts floating past and the odd water buffalo wallowing lazily in the shallows...and the karst peaks rising up silhouetted against the sky.